Cruise east along the French Riveria, peer upon Menton as you leave French waters and you’ll sail along Italy’s Riveria, or the Ligurian Coast. The waters alter politically, but geographically you’ll find the same stunning rugged coast, lined with perfectly pruned pine trees, winding roads and homes precariously perched upon the jagged hills. If your yachts docks in Imperia, consider a visit by car to Laiguelia and Alassio. The former is an ancient fishing village where boats used to be hauled onto the beach. 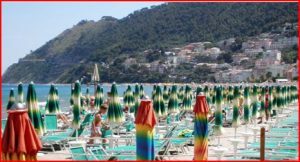 Today, it has kept the charms of the coastal settlements where the growing of olives in the hills contrasts with the narrow lanes and vaulted boat shelters lining the sandy beach. Deep green shades and the silver foliage of the olive groves are the background to ochre, beige, and stoney facades of timeless elegance.A five-minute drive further east along Via Aurelia brings you to the resort town of Alassio. It was made famous during the twenties and thirties when numerous visitors from Britain would migrate there during the drab winter months of the north. Many palatial residences line beaches and dot the surrounding hills. Its sand beach is a bliss for inspirational winter walks, while the pastel and salt bleached cabanas and colorful umbrellas towered by majestic pine trees make it an attractive summer outing. The Muretto, a wall clad with celebrity signed and created tiles is a favorite landmark where Hemingway and the likes left their marks.